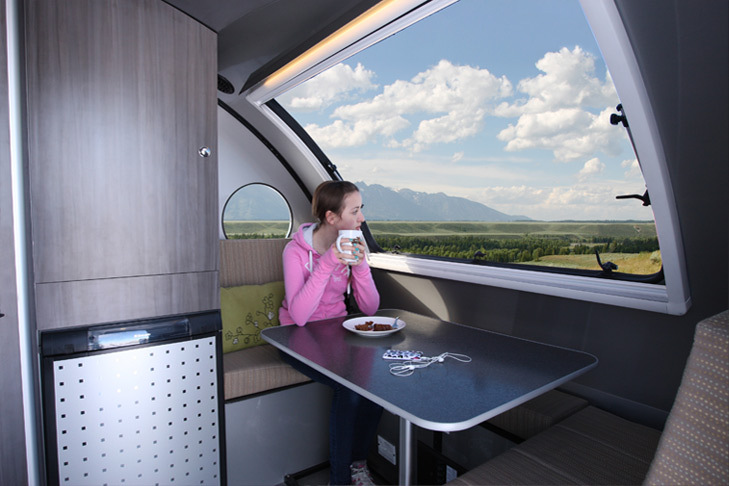 Canadian RV manufacturer Safari Condo has added a fixed roof version of their Alto travel trailer to their line-up. 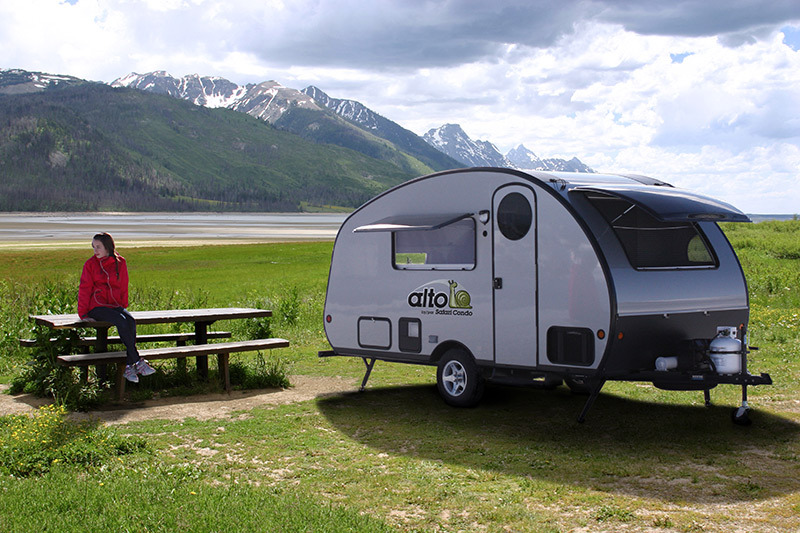 The Alto initially hit the Canadian RV scene around 2009 with the unique teardrop shaped travel trailer with an electric retractable roof. 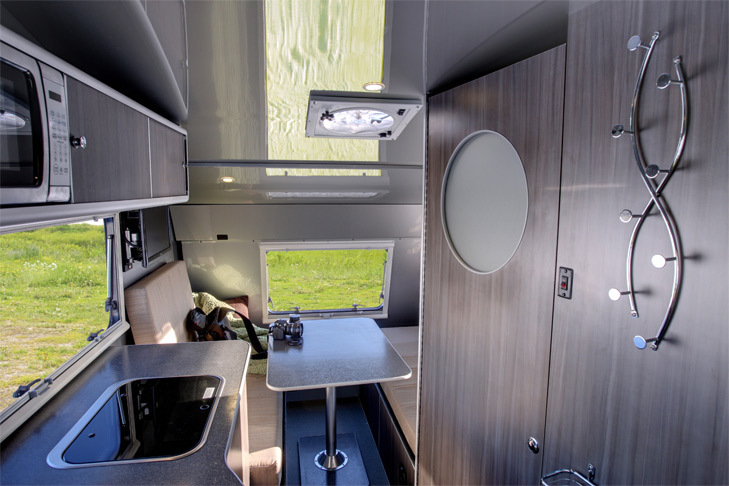 But new for 2013 is a fixed roof option (Model F1743), which checks in at 17 feet long and a dry weight of 1600 lbs. The light weight of the Alto can be attributed to the aluminum frame, floors, and the Alufiber skin. It also boasts an enclosed shower/toilet combo. “To our knowledge the F1743 is probably the lightest 17ft trailer with a real bathroom”, says Daniel Nadeau, president of Safari Condo. While the F1743 will have a price tag between $25,000-$29,000 (Canadian $$) nicely equipped, it’s still about $5,000 cheaper and over 100lbs lighter than the retractable roof models, while also offering nearly 30 cubic feet more storage space. I’ve been aware of the Safari Condo line for a few years now, but have never really paid much attention to them until recently. Still, I’ve never seen one in person and can’t attest to any build quality. However, if the old saying “you get what you pay for” still holds true, it should be a well-built unit. However, common sense should prevail if considering a purchase of one, and I’d suggest inspecting one first hand before committing. All the Alto models are available to United States buyers through Safari Condo.